Looking south towards Mile End Road along Grove Road sometime prior to 1906. 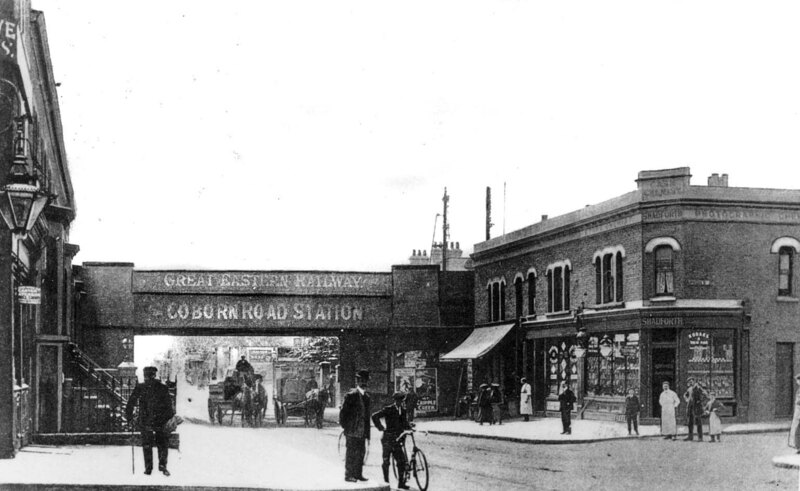 On the left and in front of the bridge a gatepost topped by a lamp can be seen; this was the start of the footpath which led to Coborn Road station. The end of the platforms and the Grove Road booking office and steps to the platforms were some 250ft away while Coborn Road itself was a quarter mile away. There was also a sign announcing Coborn Road Station facing onto the road on the left but out of view here. The bridge itself has long since received a rebuilt superstructure and the road beneath it lowered, while none of the buildings seen here still exist. On the right is Shadforth's chemist and photographer; the address was 63 Grove Road E3. Today, trees stand on the site and an entrance to Mile End Park is located approximately where the side street once was. Perhaps not immediately obvious is the tramway and beyond the bridge a horse tram is approaching, plus what appears to be another going away from the camera. This was North Metropolitan Tramways yellow route between Limehouse and Victoria Park via Burdett Road and Grove Road. In 1895 the fare was recorded as being 2d. This was flat fare and horse tram routes were colour coded. Long before the days of London Transport there was also an omnibus service duplicating the tram route (this was common practice) and colour coded green. The bus fare was 3d and the route continued south to West India Docks. The tramway was to be electrified using the overhead system under the auspices of London County Council Tramways, better known simply as LCC Tramways. The electric tram route was the 77 under both LCC and, from 1933, London Transport and operated Aldersgate - Angel - Islington - Dalston - Hackney - Victoria Park - Mile End - West India Docks. On reaching the Mile End Road, trams crossed routes 61 and 63 (the junction was then a staggered crossroads) which changed from overhead to conduit current collection at the change pit located right outside Mile End station. The 77, however, continued southwards along Burdett Road with overhead collection. Most tram routes north of the River were abandoned prior to WW2, the exceptions being the routes using the Kingsway Subway (31, 33 and 35). Whilst some tram routes north of the river had gone prior to 1935, it is little known that the bulk of pre-war tram abandonments was part of the 1935 New Works Programme which is generally associated with London's railways and in particular those of London Transport and the LNER. Many abandoned tram routes were replaced by trolleybuses. The 77 tram became the 677 trolleybus, thus retaining a semblance of the former tram route number but whether this was coincidence or not is unclear; later, London Transport's trolleybus replacement programme made more of a point of giving replacement motor bus routes a semblance of the former trolleybus route numbers. The route of the 677 was West India Docks - Burdett Road - Mile End - Grove Road - Victoria Park - Hackney - Dalston - Essex Road - Goswell Road - Clerkenwell Road - Smithfield. London's trolleybus replacement programme began in 1959 and was done in stages commencing on 4 March that year. The 677, together with the 555 and 681, all three operated by Clapton and Lea Bridge garages, was converted to motor bus operation as route 277 from 15 April 1959 using RTL class buses, then from 1967 RT class buses until going over to OMO operation in 1974. The 277 route has undergone a number of alterations over the years and is thus impractical to describe fully in this image caption; suffice to say that at the time it took over from trolleybuses it was extended to Cubitt Town (Saunders Ness Road) and operated via Manchester Road and West Ferry Road to West India Dock and thereafter the former trolleybus route. As of 2017 the 277 operates between Crossharbour and Highbury Corner but still serves Mile End, Grove Road, Victoria Park, Hackney and Dalston thereby maintaining a reminder of the former trolleybus and tram routes once serving Grove Road.